RIO DE JANEIRO, BRAZIL – After catching a collective breath following Rio’s Carnival escapades, expatriates and Carioca friends will be kicking March off with the next Gringo Group Therapy Happy Hour event, held at the Gringo Café in Ipanema. 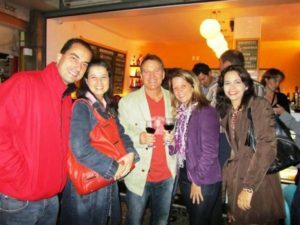 This month, Friday, March 2nd starting at 7PM, will be co-sponsored by popular Meetup Group “Expats and English Speakers of Rio de Janeiro”. 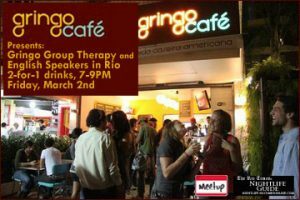 Ipanema's monthly Gringo Group Therapy Happy Hour will partner with Meetup this Friday, March 2nd, photo by Gringo Café. Anthony Giuffida who leads the Meetup Group, is excited about the partnership in promoting the Happy Hour, saying there is no better place to host an event aimed at foreigners or ‘gringos’ since the venue has such as strong connection with the expatriate community. Giuffida started the Group in 2007, which has almost 800 members and has put on some 52 events and counting. For a time the name had changed, and the group focus was expatriate entrepreneurs and real estate, but this has evolved back to a more social direction. Attendees mingle at the last Meetup and Gringo Group Therapy Happy Hour in September, photo by Sam Flowers. The monthly Gringo Group Therapy started as an informal happy hour in March 2011 by Flowers as an organic get-together. The events typically have a relaxed atmosphere, and often feature a topic such as visa issues, real estate, Portuguese language or financial planning. The event was wonderful — over 60 expats and English speakers in attendance! lots of fun! great business and social contacts!